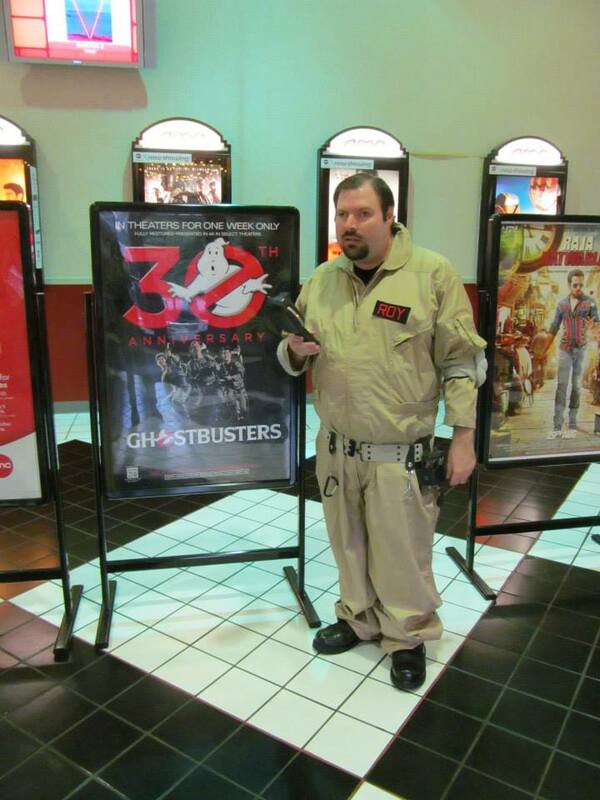 On Friday, August 29, 2014 Ghostbusters New Jersey personnel went to meet with our fans (or they might have been ghostheads) for a 30th Anniversary GHOSTBUSTERS™ Cinemark screening. I didn’t go because of the drive back to central Jersey at a much later hour. 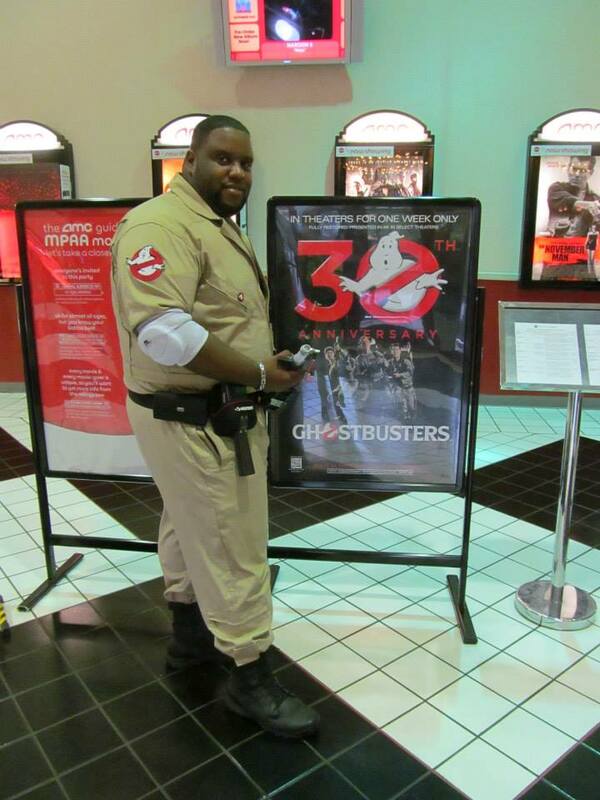 The same night the North Jersey Ghostbusters (Facebook) and friends were meeting with fans and seeing a 30th Anniversary GHOSTBUSTERS™ AMC screening. That’s the location I was planning to go to. Either way I was too tired to drive. I was going to need as much rest as possible because on Saturday, August 30, 2014 I was headed north to familiar residential and business areas. 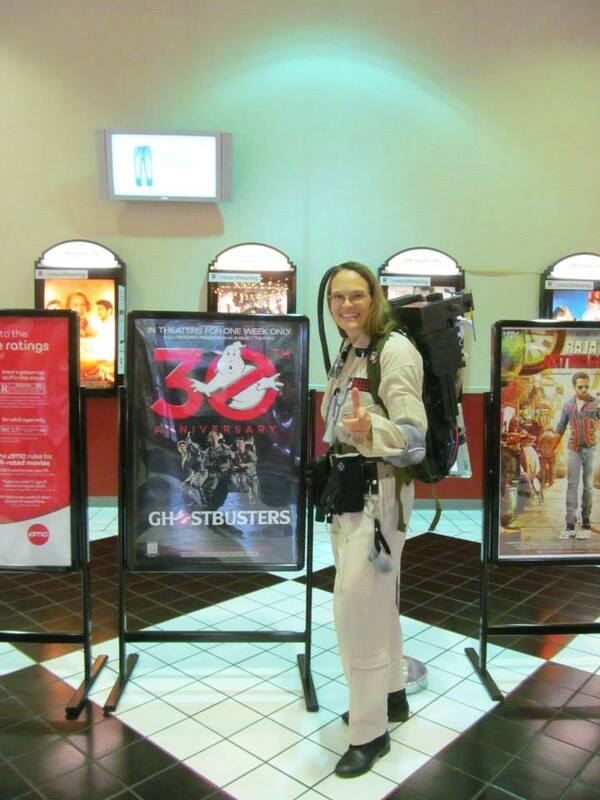 To try not to be too tired and not get back that late I chose to see a matinee showing of GHOSTBUSTERS™ at the Clifton Commons AMC with a friend of mine who lives in the area. 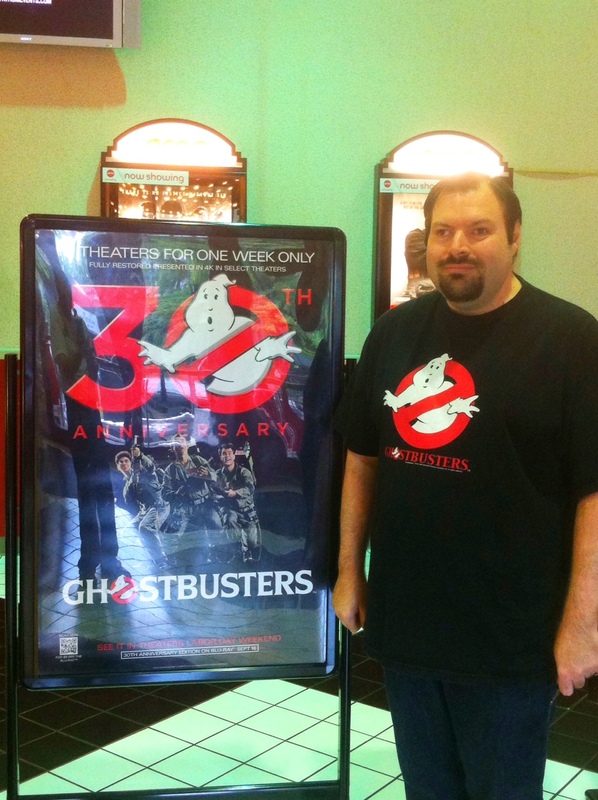 Standing with a Ghostbusters 30th Anniversary poster at AMC Wayne. It was most likely the 1:15 show time, there weren’t many people at this screening. No costumed or potential Ghostbusters recruits. I had my uniform and gear with me, in hindsight sorta wish I would have worn it anyway. As I was wearing my licensed Ghostbusters t-shirt circa 2008 at least a few people, including a kid said Ghostbusters excitedly and were complimentary, more about the franchise then the threads. After the screening my friend and I tried a replacement Italian restaurant (the same location had previously been another chain Italian restaurant) which I could recommend if we were Italians and lived in Italy. As the sun was beginning to set on a cloudy afternoon with light rain I was debating if I would still drive further north to meet up with North Jersey Ghostbusters at 6:00 before their screening at 7 PMish show time. I sorta dragged my friend with me. As we drove I took in somewhat scenic backroads and towns I use to drive on often. As we were nearing Wayne, it felt longer then I remembered. Was almost hard to believe I drove those routes all the time. After Jody talked to the manager (who had been expecting us) and meeting with her and some theater staff by my car, I suited up outside, (not as I usually would) ready to see what the early evening would bring. As an aside I worked at this very same theater (when it was a Sony ironically enough) in 1997 for a short period of time. I didn’t know how I’d feel about being there. I hardly would see movies there, wasn’t exactly convenient. Plus within three years I was working for another theater chain. In the lobby we began taking pictures with management and theater staff. My friend Will by default became our freelance photographer. It was appreciated, I wish he could have taken every pic with cameras and phones we have access to so we’d have more of the photos that were taken. I “Murrayed” up my uniform. I, Rich was probably talking and in a need of a refreshing soft drink. I look like Vigo wanted to control me. Jody and Mike ready for popcorn. After the barrage of photos (um sure) the screening was about to begin, with previews. The North Jersey Ghostbusters previewed they were ready to believe you by walking down the aisles with their packs, in stand-by mode. I think. It was about this time we parted ways. I was headed back to District 1. If Will and I had stayed at least 5 more minutes we would have met up with friends and North Jersey Ghostbusters Ron Giameo and Carol Jacky.